Most oscilloscopes are equipped with a trigger circuit to start measuring when a certain condition occurs in the input signal. Triggering is used both for capturing unique signal events and to stabilize the display of repetitive signals. Without triggering, signals are measured and displayed at random times. The trigger circuit has several settings which are divided into instrument trigger settings and channel trigger settings. Most trigger settings are combined in the Trigger properties dialog. To open the trigger properties dialog, click the button on the instrument toolbar. The trigger properties dialog allows to view and control instrument and channel trigger settings. Additionally, it gives an explanation on the selected trigger type and examples that do cause a trigger (left column) and do not cause a trigger (right column). There is a dialog available for each opened instrument. This section treats the instrument trigger settings. These settings affect the whole instrument, as opposed to the channel trigger settings, which affect only one channel of the instrument. Several different trigger settings are available which determine how the system will trigger on a signal. The trigger source setting of the instrument determines which trigger signals are used to trigger the instrument. The trigger source can be set to a single channel or to any combination of channels or other trigger sources. The sources can be logically combined using an OR function. In the image below, the trigger source is set to Ch1 OR EXT1. When no trigger source is selected, the trigger system is disabled and the instrument is free-running: it will start measuring the post samples directly. Opening the Trigger properties dialog and selecting the required trigger source using the source selector. The option Advanced gives the possibility to set a combination of multiple trigger sources. Clicking the trigger source label in the combined Time-out + Trigger source indicator on the instrument toolbar and selecting the required value from the popup menu. Dragging the trigger symbol ( , etc.) from one axis to another axis in a graph. Right-clicking the instrument in the Object Tree and selecting Trigger source and then the required value in the popup menu. Right-clicking the trigger symbol on an axis and selecting Move to and then the required value in the popup menu. Using the Trigger source enable button on the channel toolbar for the required channel. Channels can be used as trigger source. 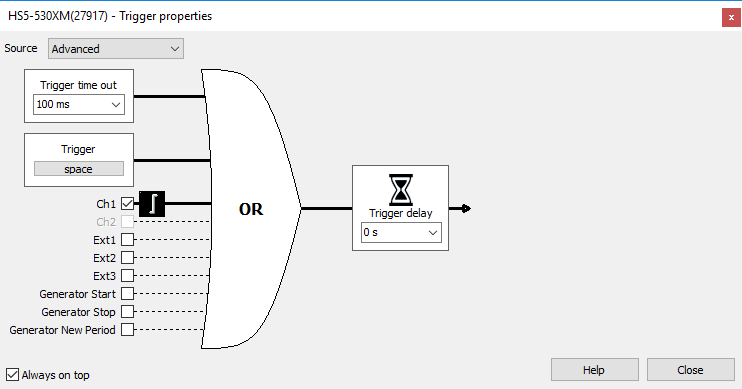 Channel triggers are configurable through Trigger type, Trigger level, Trigger hysteresis, Trigger condition and Trigger condition time properties. Besides the normal input channel triggers, most TiePie engineering instruments have an external trigger input, which can be used to connect a external digital trigger signal. Trigger level and hysteresis can not be set for this trigger input, but the edge (rising or falling) the system should react to can be set. This signal is generated when continuous generation or burst generation is started, either by the Start button or by an external trigger signal. This signal is generated when the whole buffer of the Arbitrary waveform generator has been processed and the Arbitrary waveform generator starts at the beginning of the buffer again. This signal is generated when continuous generation of burst generation is stopped by the Stop button or burst generation is stopped because the required number of periods has been generated. With digital storage oscilloscopes, the record length determines the number of samples that are measured. All these samples can be measured after the trigger has occurred. It is however possible to measure (a part of) the record before the trigger occurs, by selecting pre samples. The total record will then be divided in a pre trigger part and a post trigger part, respectively containing pre samples and post samples. This way it is possible to "look back in time" since the pre samples were captured before the trigger moment. With the TiePie engineering instruments it's possible to define the trigger moment at any position in the record. By clicking the increase/decrease pre trigger percentage buttons and on the instrument toolbar. By using hotkeys Shift + ← and Shift + →. By dragging the small triangle on the slider in the horizontal scrollbar under the graph displaying signals from the instrument left or right. The position of the triangle in the scrollbar represents the trigger moment in the measured record. By using the pre samples turning knob on the instrument toolbar. By right-clicking the horizontal scrollbar under the graph displaying signals from the instrument and selecting Pre trigger and then the appropriate pre trigger percentage in the popup menu. By right-clicking the instrument in the Object Tree, selecting Pre trigger and then the appropriate pre trigger percentage in the popup menu. Hint: When setting the trigger moment through a popup menu, the option User defined... also allows to set the value as a number of samples or as a time. When pre samples are selected, the trigger system is not activated yet until a specified amount of samples are measured after starting the measurement. This amount of samples is called the trigger hold-off. When the input signal(s) meet the trigger requirements during the trigger hold-off period, this will not generate a trigger and the system will remain sampling pre samples. After the trigger hold-off has passed, at the first occasion that the trigger conditions are met, the system will start measuring post samples. This will ensure that at least that specified amount of pre samples will be measured. The trigger hold-off can is set as a number of samples. Two special settings are also available: Presamples valid or Off. In the setting Presamples valid, the trigger hold-off value will always be equal to the number of pre samples that are selected. This will ensure that the complete pre sample buffer is always filled with measured samples. When trigger hold-off is switched off, the trigger system is activated immediately after starting the measurement. The system will not first fill the pre sample buffer before the trigger system is activated. Depending on the measured signal and the moment the measurement was started, this may result in a situation where not all pre samples are measured, but the first pre samples remain 0 V.
Trigger hold-off = off is useful when measuring once-only events, because in this way never a trigger will be missed. If the system would first fill the pre samples buffer before activating the trigger system, it might happen that the event that should cause a trigger would take place while still filling the pre samples buffer and therefore not generate a trigger. No measurement would take place. Not all TiePie engineering instruments support trigger hold-off. When trigger hold-off is not supported, the trigger system functions as if trigger hold-off was switched off. Opening the trigger properties dialog, selecting trigger source "Advanced" and adjusting the trigger delay. Right-clicking the instrument in the Object Tree and selecting Trigger delay in the popup menu. The delay can then be set by entering the required value in seconds. Once the trigger conditions are set and the measurement is started, the instrument will wait until the trigger conditions are met before the post samples are measured and the measurement is finalized. If the trigger conditions are set in such a way that the input signal(s) will never meet the trigger settings, the instrument will wait forever. When no measurement is performed, no signals will be displayed. To avoid that the system will wait infinitely, a trigger time-out is added to the trigger system. When after a user defined amount of time after starting the measurement still no trigger has occurred, the trigger time-out will force a trigger. This will ensure a minimum number of measurements per second. On conventional desktop oscilloscopes, this is called Trigger mode AUTO and the used value is approximately 20 ms. Immediately after starting a measurement a trigger is forced. Basically this bypasses the trigger system and the instrument always measures immediately. No pre samples are recorded. The instruments is free-running, just like when no trigger source is selected. The system will wait infinitely for a trigger. The software will never force a trigger, only when the trigger conditions are met, a trigger will occur and a measurement will take place. This setting is particularly useful for single shot measurements. On conventional desktop oscilloscopes, this is called Trigger mode NORM. Opening the trigger properties dialog and adjusting the trigger time-out. Clicking the button on the instrument toolbar or pressing hotkey W will toggle the trigger time-out between the set value and infinite. Clicking the button on the instrument toolbar or pressing hotkey 1 will toggle the trigger time-out between the set value and infinite. Clicking the button on the instrument toolbar or pressing hotkey 0 will toggle the trigger time-out between the set value and zero. Besides using the available trigger sources and the trigger time-out to start a measurement, it is also possible to stop waiting for the trigger time out and to start measuring the post samples right away by forcing the trigger of the instrument. Using the Trigger now! button on the instrument toolbar. Channel trigger circuits monitor the channels continuously and generate a trigger signal when the input signals meet some predefined trigger condition. To change this condition, several channel trigger settings are available which can be adjusted for all channels individually. Opening the trigger properties dialog and selecting the required trigger type from the list of available trigger types. Right-clicking the trigger symbol on an axis and selecting Trigger type and then the required value in the popup menu. Right-clicking the channel in the Object Tree and selecting Trigger type and then the required value in the popup menu. Dragging/moving the trigger symbol ( , , etc.) on an axis of an oscilloscope channel that is used as trigger source. The trigger level can be changed by moving the edge of the symbol associated with the level, or by moving the whole symbol. Opening the trigger properties dialog and adjusting the required trigger level(s). Right-clicking the trigger symbol on an axis or the associated channel in the Object Tree and selecting Trigger level or Trigger level 2 in the popup menu. The level can then be set by selecting one of the pre defined values. A User defined... setting is available that also allows to an arbitrary value. Using hotkeys F7 and F8 in combination with the appropriate channel selection hotkey(s) (only trigger level 1). Clicking the increase/decrease trigger level buttons and on the channel toolbar (only trigger level 1). All oscilloscope channel trigger types use one or two trigger hystereses. The hysteresis defines the distance between the firing level and the arming level and determines the sensitivity of the trigger system. A small hysteresis means that the arming and firing level are close to each other and a small signal change will be enough to cause a trigger. A large hysteresis means that the signal change must be large before a trigger is generated. This makes the trigger system less sensitive to noise. Dragging/moving an edge of the trigger symbol ( , , etc.) on an axis of an oscilloscope channel that is used as trigger source. Opening the trigger properties dialog and adjusting the required trigger hysteresis. Right-clicking the trigger symbol on an axis or the associated channel in the Object Tree and selecting Trigger hysteresis or Trigger hysteresis 2 in the popup menu. The hysteresis can then be set as a percentage of the full scale input range of the channel by selecting one of the pre defined percentage values. The corresponding voltage is also displayed. A User defined... setting is available that also allows to set the trigger hysteresis as a voltage. Using hotkeys [ and ] in combination with the appropriate channel selection hotkey(s) (only trigger hysteresis 1). Clicking the increase/decrease trigger hysteresis buttons and on the channel toolbar (only trigger hysteresis 1). None there is no additional trigger condition. Shorter than the signal requirements defined by the trigger type must last shorter than the specified trigger condition time to cause a trigger. Longer than the signal requirements defined by the trigger type must last longer than the specified trigger condition time to cause a trigger. Inside the length that the signal requirements defined by the trigger type last, must be inside the trigger condition time frame to cause a trigger. Outside the length that the signal requirements defined by the trigger type last, must be shorter than or longer than the trigger condition time frame, in other words outside the trigger condition time frame to cause a trigger. Using the Condition selector in the trigger properties dialog. Right-clicking the trigger symbol on an axis or the associated channel in the Object Tree and selecting Trigger condition and then the required value in the popup menu. The trigger condition time specifies the duration of a specific signal condition, in seconds. When two trigger condition times are available, the two times define a trigger condition time frame, in seconds. Entering the required value in the Condition time or Condition time 2 box in the trigger properties dialog. Right-clicking the trigger symbol on an axis or the associated channel in the Object Tree and selecting Trigger condition time or Trigger condition time 2 in the popup menu. The time is entered in seconds.